The first thing done upon leaving the terminal in Denver is to change to sun glasses. The light is just that much more bright (the UV rays that much more intense) than Connecticut even on its sunniest day. In my case, it was to put on some photo grays, which immediately darkened. Just looking out of the terminal windows, I felt an unintentional squint. Another case of deja vu of man vs the environment, but well worth the effort. At twenty something, I remember donning sun glasses just to look "cool". Who knew all those UV rays would give us all cataracts if we hadn't put on the specs. The view as I sit looking out the window is nothing less than spectacular. A native agave seed stalk frames the mountains encircling the line west. In this heat of summer, July 4th, they are awe-inspiring, crowned with a snow cap. Then I look down at the garden. There is a riot of familiar plants gone wild and tall in this western clime. 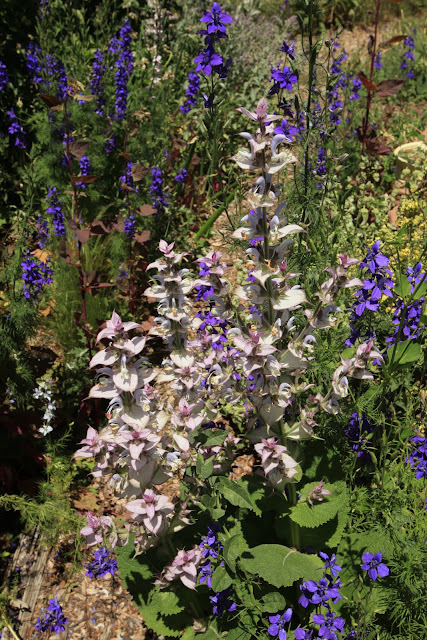 An immediate standout is the verbascum rosette among the delphiniums. Stirred to walk the paths, I encounter many well loved plants. Can that be Glaucium falvum? Amazing variations present themselves. The orange center is quite striking - can it be sunburn? The smell is overpoweringly fresh. 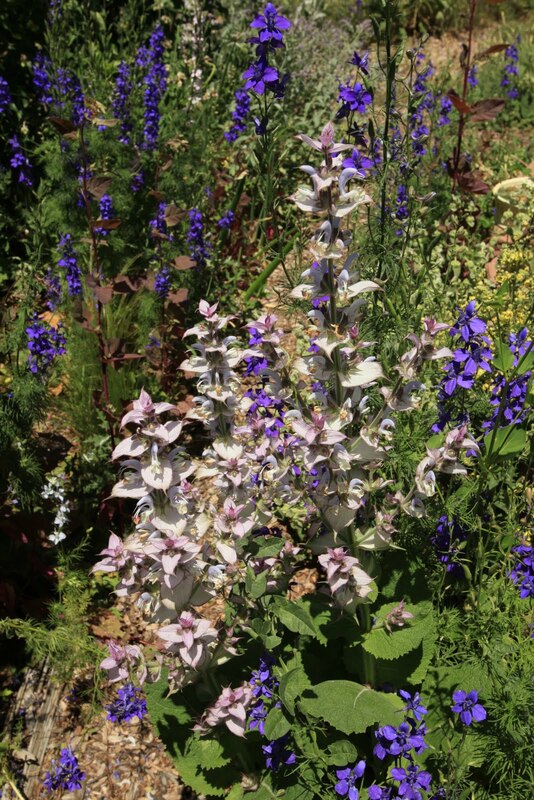 Imagine the scent of salvia mixed with sage, spiced with mullein. As you know most people have straight hair. But some have curly. It is not unusual for the curly set to try and look like the rest. And they do, but sometimes, they enjoy their nature, to the delight of they eye. It's like that with gardeners too. Some gardeners have very linear architectural gardens. They are wonderful. Others have the natural ability to create a whole orchestra of interwoven planting. It is outstanding. We are staying at the home of a seed collector, long time gardener and plant hunter. Whimsey and long experience typify the garden. This garden is exciting...stirring...and vibrant to the point of being exclusive.